Every spring and summer, birders go in search of the superbly colorful birds that come back to the temperate US from tropical regions — including the Painted Bunting. It just doesn’t seem possible that one bird could pack so much visual impact onto a body that’s only slightly larger than a goldfinch. Painted Buntings nest in nearly all of Texas and in adjoining states to the east, as well as the coastal lowlands of the Southeast. By the time winter settles in, though, South Florida is the place to look. Today’s show brought to you by the Bobolink Foundation. Every spring and summer, birders go in search of the superbly colorful birds that come back to the temperate US from tropical regions. Tanagers, orioles, hummingbirds, and gem-like warblers are all stunning birds, flashes of primary color against the greenery. But even they pale in comparison to the Painted Bunting. Painted Buntings nest from Texas to the coastal lowlands of the Southeast. By the time winter settles in, though, south Florida’s the place to look. Where you might find those that haven’t headed to Central America or Cuba around a seed feeder. And you can see for yourself why this little bird is such a crowd pleaser. Bird sounds provided by The Macaulay Library of Natural Sounds at the Cornell Lab of Ornithology, Ithaca, New York. 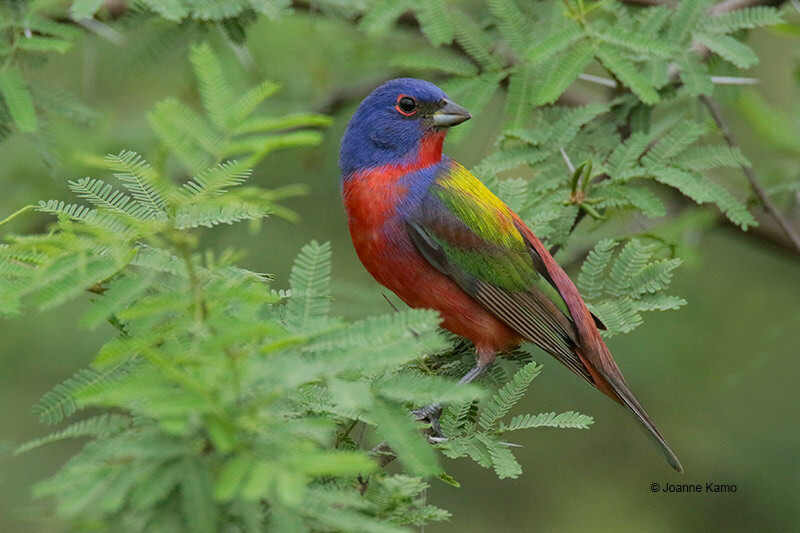 Painted Bunting song  recorded by Bob McGuire at Big Bend National Park in Texas, on May 3rd 2013.